Collaboration, leading to innovation, leading to success. Based upon gathering together to share ideas and information. Working together as a team to bring ideas to life. And putting together a consistently reliable, secure, scalable, easy-to-use, and easy-to-integrate system to empower all of it. 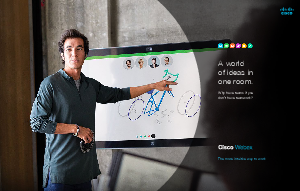 Cisco collaboration solutions learn as they work together with your team. Frictionless collaboration experiences make customers happy to work together with you. Work with Cisco Webex. And your teams will work better together.